How much should I budget for Ecommerce, SEO and PPC? What are Ecommerce brands like yours spending on search engine marketing? It is a question which all marketers have probably wondered at some point; How much marketing budget should be spent on SEO and PPC? It’s quite the balancing act, either risk spending too little and see no results, or spend too much and watch ROI tumble? We take a look at some industry benchmark data specifically for ecommerce brands and see how marketing practitioners are spending their budgets. 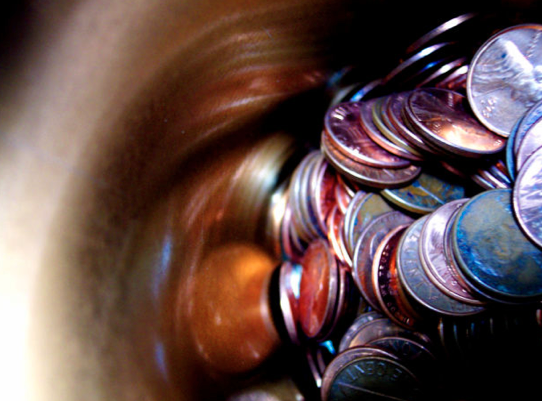 Marketing budgeting should be designed specifically to meet your ecommerce goals. Different types of goal are more suited to different channels, for example if you want to get a better ROI on marketing spend you might want to shift some budget from PPC to SEO. Conversely, if you’re looking to increase sales in the next quarter, you might want to turn on some paid media advertising in order to generate more immediate sales. If your goals focus on an increase in brand awareness, or customer retention, then you might want to focus your budget towards social media and email marketing. So carefully consider the benefits across different channels that you can effectively use to meet your objectives before diving into budgeting! Over 4000 ecommerce merchants including leading retailers within the IR500, responded to a survey by Marketing Sherpa following a research grant from Magento, the ecommerce software provider. The eMarketing Sherpa eCommerce Benchmark Study found what percentage of their marketing budget eCommerce brands are spending per channel based on the company’s revenue. Low revenue companies with an average of $1 million turnover spend more than double the percentage of their budget on SEO (24%), compared to larger revenue brands with an average of $100 million turnover (10%). It’s fair to say that most companies with a revenue in excess of $100 million have been established online for longer than companies with an average of $1 million in revenue. Therefore, this “doubling-down” on average SEO spend shown in this data reflects that new companies have to put in more budget to get SEO off the ground. Long established companies with a bigger reputation will have already built more authority over time and therefore require a smaller percentage of their revenue to be spent on building links. 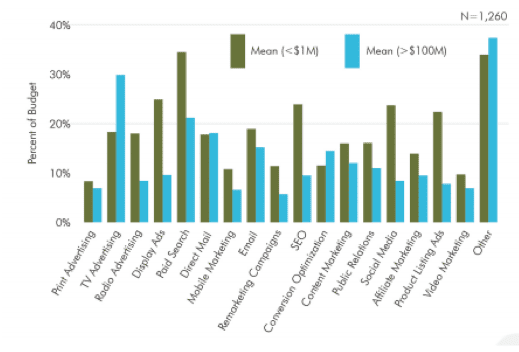 This research shows that ecommerce companies with on average less than $1 million revenue spend the highest percentage of their marketing budget on the paid search channel, with 35% of marketing budget going on this channel. Many companies consider product listing ads to be covered under the term “paid search”. If product listing ads data from this research (22%) are combined with paid search data (35%), the combined paid search spend would make up 57% of marketing budget for companies with less the $1 million average revenue. For brands with over $100 million average turnover the total percentage of budget spent on paid search including product listing ads is 29%. The research shows that companies with an average of $1 million in revenue spend the large majority (81%) of their marketing budget on SEO and PPC combined. Larger brands with $100 million average turnover spend more than a third (39%) of their entire marketing budget on SEO and PPC combined. What should I budget for ecommerce SEO & PPC? According to BRAD’s 2015 research of over 6,000 brands, the majority of marketing budgets are based on 2-15% of revenue, which means $1 million turnover companies are budgeting 81% of their revenue on SEO and PPC at $16,200 - $121,500 per year ($1,350 - $10,125 per month). Corporate marketing budgets are typically a larger percentage of revenue with larger turnover companies spending 7-66% of turnover on marketing. Therefore $100 million turnover companies are budgeting 39% of their revenue on SEO and PPC at $2,730,000 - $25,740,000 per year ($227,500 - $2,145,000 per month). What does your own data tell you? Although this research is incredibly insightful to understand what your competitors are doing and the ecommerce industry as a whole. The most important and relevant benchmarks are always your own. If you’re lucky enough to have one or more years’ worth of data with ecommerce tracking, this data is not to be ignored. If your website is driving a good amount of revenue from a variety of channels, then shifting budgets between channels, especially SEO and PPC, should be very carefully monitored and tested. As with all marketing activity the rule for budgeting for SEO and PPC is simple, plan, test, analyse and refine. Olivia Collins is Digital Marketing Executive at Digital Marketing Agency ThoughtShift, an award-winning agency specialising in increasing eCommerce SEO and PPC sales. Olivia writes regularly on the latest trends in digital marketing and consumer behaviour online. Follow ThoughtShift on Twitter for LinkedIn for bite sized digital marketing tips.